The Quileute Tribe raises a wild summer Chinook stock and a winter steelhead stock in cooperation with the Washington State Department of Fish and Wildlife. For an overview of our facilities, open or download our Hatchery Slide Show. 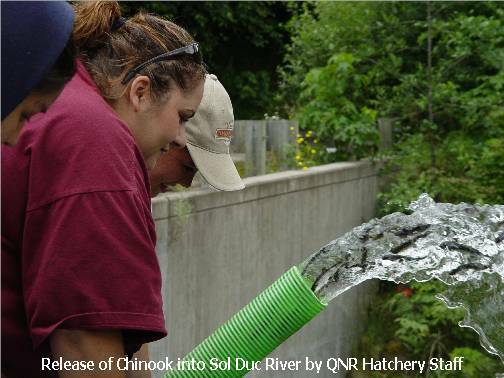 Release of healthy young salmon into the river is one of the most satisfactory aspects of hatchery management. It is the culmination of a process that starts with broodstocking, when returning wild adult fish are selectively harvested for egg and milt extraction. The fertilized eggs are carefully raised in clean, oxygenated and oscillated trays and watched carefully for disease. They are held in these vertical incubators until they emerge as small fry. When the salmon reach a certain size, the tribe inserts coded-wire tags into the heads of the fish to identify returning adults as wild or hatchery in origin. The steelhead’s adipose fins are clipped for later identification. The next stage is to transfer the fish to our indoor troughs, where we monitor their feeding. Finally, they are placed in outdoor raceways until release time. Only healthy fish are allowed to enter the river system to enhance and rebuild the wild population. The tribe works closely with state and Northwest Indian Fisheries Commission experts to use the best disease prevention/management techniques, to reduce loss and to avoid introduction of disease into the ecosystem. At all stages of the operation, the hatchery staff monitor for disease and respond immediately to any needs of the fish. Our hatchery is equipped with an alarm system should any water supply issues arise and the staff is on 24-hour duty. To view or download the Hatchery Slide Show, click here.